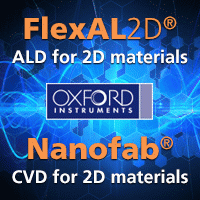 The AVS Short Course Webinar focusing on on Atomic Layer Deposition (ALD) will be held on Thursday March 15 at 1:00 PM eastern time. This webinar will be taught by AVS Instructor, Robert K. Grubbs. Dr. Grubbs has been working in the field ALD for 20 years and has applied the ALD process to solve myrid technical challenges in the semiconductor industry and in the area of national security (Principal Member of the Technical Staff at Sandia National Laboratories). 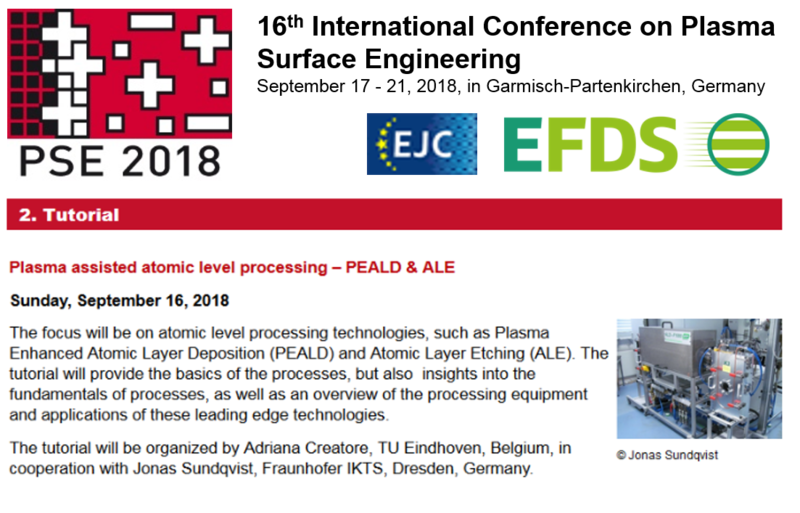 This webinar on Atomic Layer Deposition (ALD) is for anyone who wants to know specific details about how the ALD process works and how to implement ALD in a laboratory setting. The webinar will cover the basic aspects of the chemical mechanism of ALD and how that leads to the unique and potent properties of an ALD process. 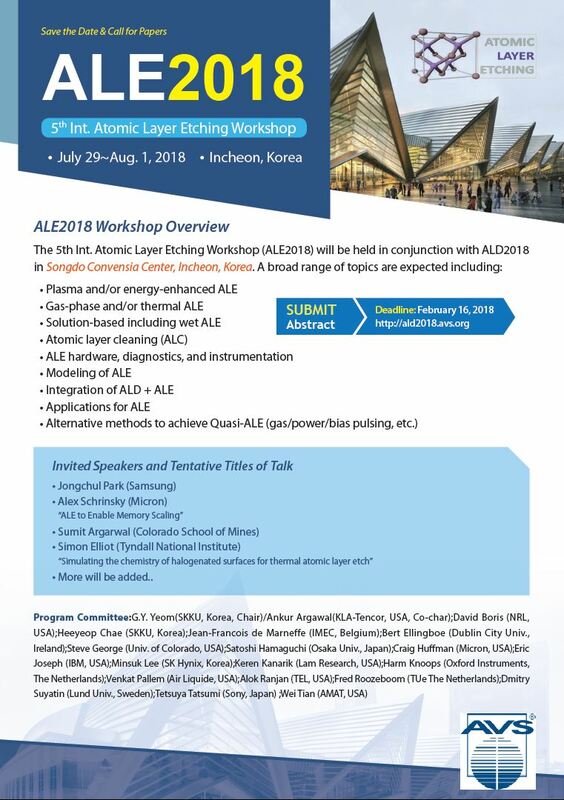 Multiple examples of ALD chemistry will be covered as well as reactor design, chemical precursor properties, plasma ALD, and molecular layer deposition (MLD). Ferroelectric hafnium oxide and related materials have been developed in Dresden, Germany for over 10 years now. At the IEDM2017 in December Globalfoundries Fab1 and their partners (NaMLab, Fraunhofer and Ferroelectric Memory GmbH) presented their latest results using the Fab1 22nm FDSOI technology with embedded NVM cells embedded as adopted "standard" high-k / metal gate stacks in the front end process module as so called FeFETs. 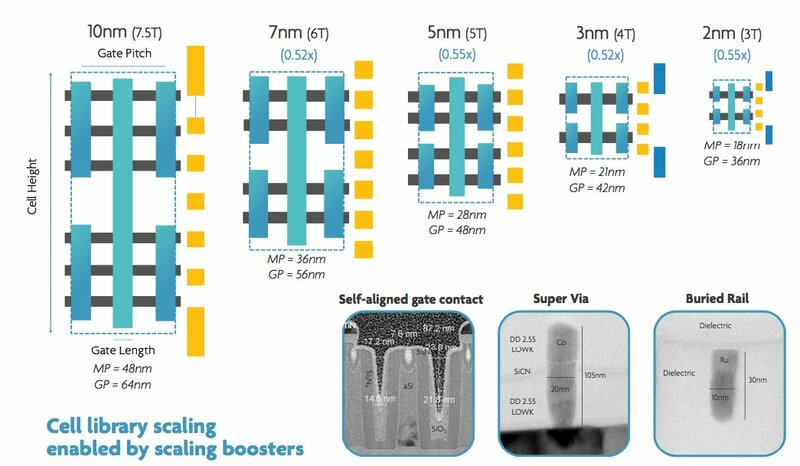 Previously much of the work was based on Globalfoundries Fab1 28 nm technology so the move to 22 nm really proves that scalig is back to ferroelectric memory technologies as shown on LinkedIn by Prof. Mikolajick (NaMLab) below.. 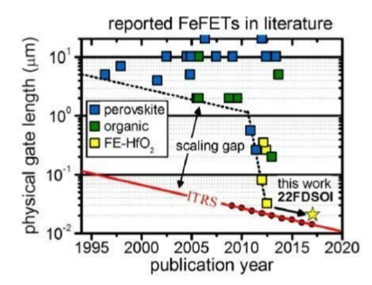 Since the high-k (doped HfO2) is deposited by ALD this technology is scalable also for FinFETs so don´t be surprised if Globalfoundries would soon present also FeFinFETs. Abstract: We show the implementation of a ferroelectric field effect transistor (FeFET) based eNVM solution into a leading edge 22nm FDSOI CMOS technology. Memory windows of 1.5 V are demonstrated in aggressively scaled FeFET cells with an area as small as 0.025 μm2 At this point program/erase endurance cycles up to 105 are supported. Complex pattern are written into 32 MBit arrays using ultrafast program/erase pulses in a 10 ns range at 4.2 V. High temperature retention up to 300 °C is achieved. It makes FeFET based eNVM a viable choice for overall low-cost and low-power IoT applications in 22nm and beyond technology nodes. There is an ongoing boom in the materials supply chain industry to supply the Electrical Vehicle (EV) manufacturers with battery materials. There are a number of concerns in the supply of the actual materials (e.g. lithium, cobalt and graphite). The technological aspects are also still broad, however it seems very likely that ALD will play a role for some of the technologies for producing future lithium batteries that we will use in basically all devices ranging from communication (smart phones) and for transportation (cars, trucks, trains, ships, airplanes etc.). ALD Nano in Boulder Colorado is the pioneer in this technology area and has recently announced scaling up their technology to run high volume of powder (3000 kg/day). They have developed a Spatial vibrationg technology refered to as Continious Vibrating Reactor - CVR. It seems to me that their technology is mature for high volume manufacturing of powder materials and that they "simply" by scaling the number and/or the size of plants can supply the know how and hardware for full scale production for any big player in the battery materials supply chain. 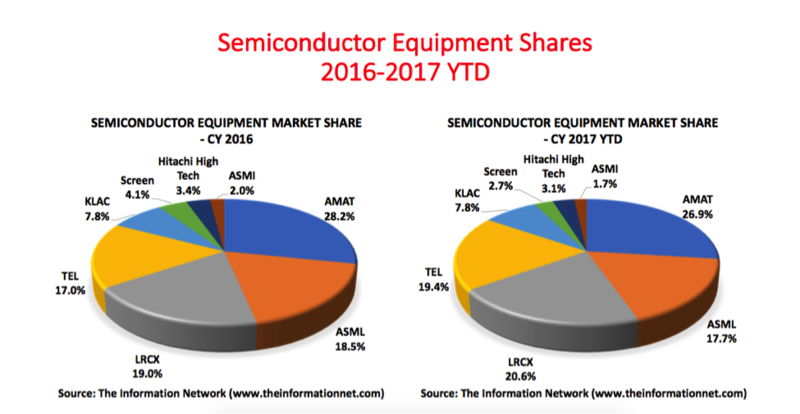 CCIA [LINK] : We asked several companies “What are the critical changes in the battery industry landscape that will have a strategic impact on your success?” This week, we’re highlighting ALD NanoSolutions. Lithium ion batteries for electric vehicles, consumer electronics, and distributed energy storage, along with new versions of lead acid batteries for vehicle start-stop fuel efficiency strategies, are driving today’s growth in the battery energy storage market. Longer term, grid-scale batteries will generate a large impact too. Overall, the dramatic changes and expansion of the battery industry are creating huge new materials markets. Every major chemical and advanced materials company in the world is attracted to this opportunity. However, for new devices like EVs to take meaningful market share, the materials for electrodes, electrolytes, and other battery components need to be engineered at the nanometer, or even atomic, scale. It is this demand for engineering new materials that improve energy storage, safety, and power management metrics, combined with the desired cost stack of inputs to the final battery price, that has a big impact on ALD Nano’s business. The key for us to succeed is to enable the new battery materials with atomic layer deposition technologies that not only solve various technical challenges to reach performance metrics, but can also scale at very low cost. 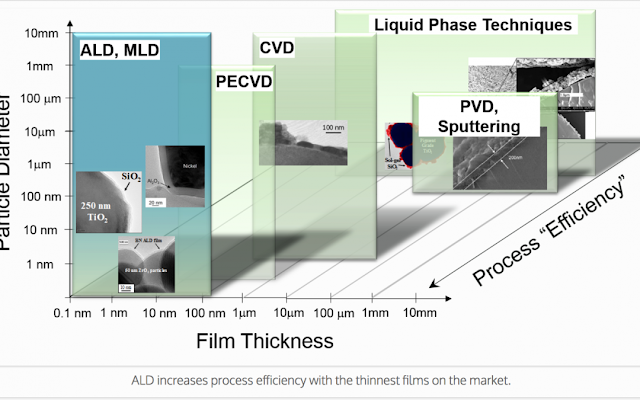 About ALD NanoSolutions ALD NanoSolutions (ALD Nano) is creating cost-effective advanced materials through its unique portfolio of atomic layer deposition technologies to transform industries. Here is a nice review on the introduction of high-k materials in the semiconductor industry and a future outlook by Prof. Hiroshi Iwai at Tokyo and Prof. Akira Toriumi Institute of Technology and their partner Prof. Durga Misra at New Jersey Institute of Technology. 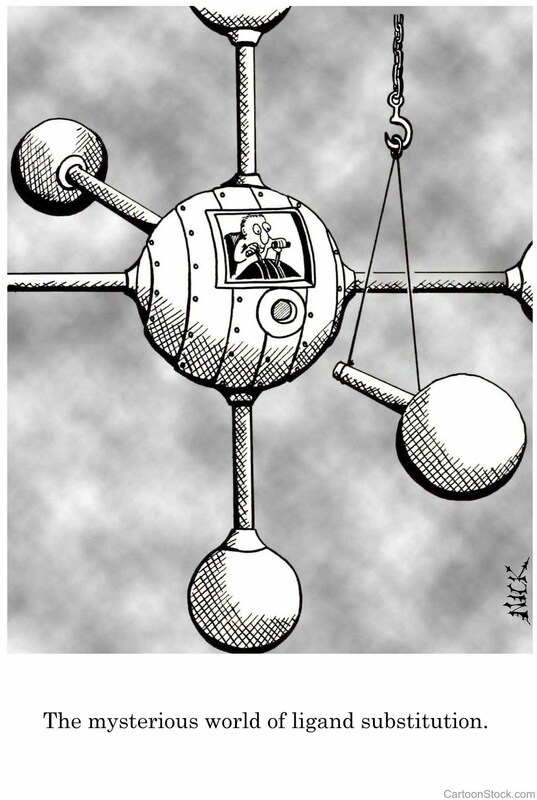 Thank you for sharing this one Rob Clark! The paper is part of a winter special issue in Interface (by ECS) with focus on "Importance of dielectric science" and is free for download. The step coverage advantage of atomic layer deposition (ALD and is possible for, high‑k migration to FinFET CMOS technology. The use of high‑k on new semiconductor substrates such as III-V, Ge and 2D materials is currently being investigated and faces many challenges. The discovery of ferroelectric properties of HfO2 makes it viable for more potential applications. Abstract: Tremendous progress of CMOS integrated circuits have been conducted by the down-scaling or the miniaturization of MOSFETs (Metal Oxide Semiconductor Field Effect Transistors). Ten years, ago, the huge direct-tunneling gate leakage current through the thin gate SiO2 film of 1 nm thickness made it impossible to further scale-down the MOSFETs, and replacing the SiO2 by HfO2-based higher-dielectric constant (high-k) material was the solution. 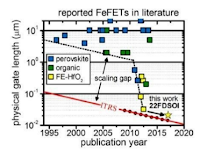 In this paper, the history of high-k gate insulator film development and two topics from recent research results regarding ferroelectricity and reliability are described. SAN DIEGO, Jan. 23, 2018 /PRNewswire-iReach/ -- TECHCET CA—the advisory service firm providing electronic materials information—and the Critical Materials Council (CMC) of semiconductor fabricators announce that David Bloss, Vice President of Technology and Manufacturing Group, and Director of Lithography Technology Sourcing in Global Supply Management, Intel Corporation, will provide the keynote address at the next CMC Conference to be held April 24-25, 2018 in Chandler, Arizona (http://cmcfabs.org/cmc-events/). Building on the success of the prior CMC Conferences, the 2018 event will feature presentations by technologists from leading fabs, OEMs, materials suppliers, and analysts. 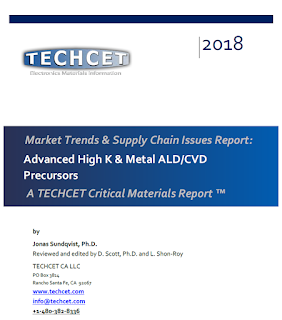 ABOUT TECHCET: TECHCET CA LLC is an advisory service firm focused on process materials supply chains, electronic materials technology, and materials market analysis for the semiconductor, display, solar/PV, and LED industries. Since 2000, the company has been responsible for producing the SEMATECH Critical Material Reports, covering silicon wafers, semiconductor gases, wet chemicals, CMP consumables, Photoresists, and ALD/CVD Precursors. For additional information about these reports or CMC Fabs membership please contact Diane Scott at info@cmcfabs.org +1-480-332-8336, or go to www.techcet.com or www.cmcfabs.org. From now on I think that it is time to start using Ångström instead of Nanometer (nm) when talking about leading edge CMOS and Memory. At SEMI:s ISS 2018 (Industry Strategy Symposium) last week Luc van den Hove, Chief Executive Officer and President of Interuniversity MicroElectronics Center (IMEC) presented their roadmap for what future Logic nodes might look like going down to 2 nm that is 20 Ångström. Burried Ruthenium Rails only 10 nm wide, which seems to be a evolution of the tungsten burried Word Lines and Bitlines introduced by Qimonda for DRAM (65nm in 2009) except offcourse these rails are burried in a dielectric which will make it stackable. Alkane - Hafnium product breakthrough consolidates Dubbo Project business case. Alkane’s wholly owned subsidiary, Australian Strategic Materials Ltd (ASM), has developed high‐purity hafnium dioxide products tailored to meet market requirements. Hafnium oxide exceeding 99.8% HfO2, and 99.9% (Hf+Zr)O2, has been produced using a proprietary process to separate hafnium from zirconium at the demonstration pilot plant at ANSTO. Over the past 12 months, ASM has consulted extensively with industry to confirm growing market demand for high‐purity hafnium, which currently depends on supply from the production of zirconium metal for specialty alloys and the nuclear industry. Global shortage of hafnium anticipated as demand is poised to outstrip current supply. Hafnium metal for super alloys is currently trading in a US$800 ‐ $900/kg range. The ASM business case assumes a conservative product price of US$500/kg for its oxide. ASM will initially produce 25tpa hafnium to meet projected market demand, ramping up to higher quantities as required. 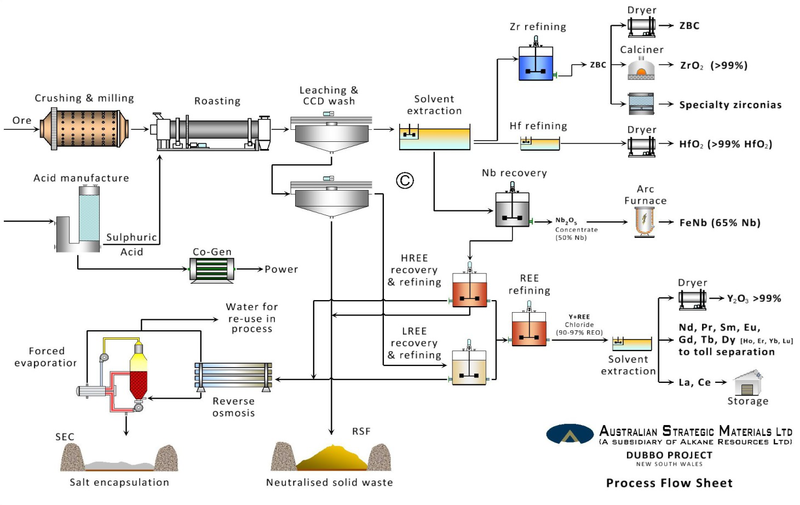 Australian Strategic Materials Ltd (ASM), a wholly owned subsidiary of Alkane Resources, has successfully developed a high‐purity hafnium dioxide (HfO2) product that will be directly marketable as a feed material for a number of downstream applications and for producing metallic hafnium. The technical specifications of this material have been tailored to meet global market requirements, following extensive industry consultation over the past 12 months. Metallic hafnium is the fastest growing market for hafnium and the most significant by volume, particularly due to the use of hafnium in superalloys and other aerospace alloys. The usual precursor is hafnium dioxide, which needs to be recovered from zirconium metal production streams. The high purity hafnium dioxide developed by ASM exceeds 99.8% HfO2, and 99.9% (Hf+Zr)O2, providing the ideal feedstock for the high‐purity metallic hafnium that is in demand for alloying purposes. A high purity hafnium chemical precursor has also been developed. The new products were produced by a proprietary process at ASM’s Demonstration Pilot Plant at the Australian Nuclear Science and Technology Organisation (ANSTO) in Sydney, New South Wales. 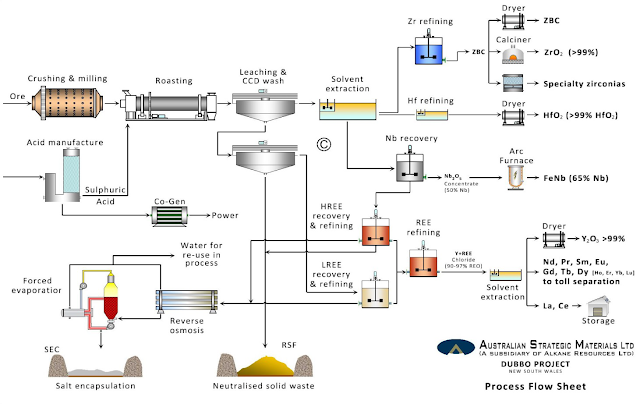 The process flowsheet for the Dubbo Project consists of a sulphuric acid leach followed by solvent extraction recovery and refining to produce several products, including zirconium, hafnium, niobium and rare earths. The process pathway to recover hafnium was developed in 2015 and proved during 2017, and allows the flexible recovery of high‐purity hafnium dioxide from the high‐purity zirconium stream. The development of this high‐purity hafnium dioxide material demonstrates the ability of ASM to produce a highly marketable hafnium product out of the Dubbo Project. ASM will continue to work with industry to secure offtake agreements and develop further enhanced products, with the view to establishing a customer base for hafnium products ahead of plant commissioning. Global demand for hafnium is rising particularly for use in metallic form, which currently accounts for around 85 per cent by volume (60% superalloys, 15% plasma cutting tips, 10% nuclear control rods). Emerging aerospace applications are expected to consume further significant volumes of metallic hafnium. Hafnium dioxide is meanwhile emerging as a material of choice in semiconductors and data storage devices (ferro‐electric applications), while many future industries such as those based on its thermo‐electric properties and super high temperature ceramics for supersonic aircraft and space vehicles will also rely on materials containing hafnium. 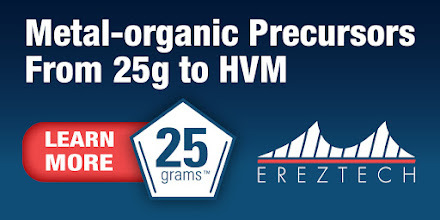 Projected growth in demand is poised to exceed current production, which is limited to about 70tpa (83tpa HfO2), since hafnium is typically only extracted from zirconium processing streams for nuclear energy applications requiring high‐purity zirconium. Market research by ASM and independent international market consultants forecasts a 2026 base demand of 112tpa (132tpa HfO2), and an unconstrained high‐demand case of 151tpa (178tpa HfO2). 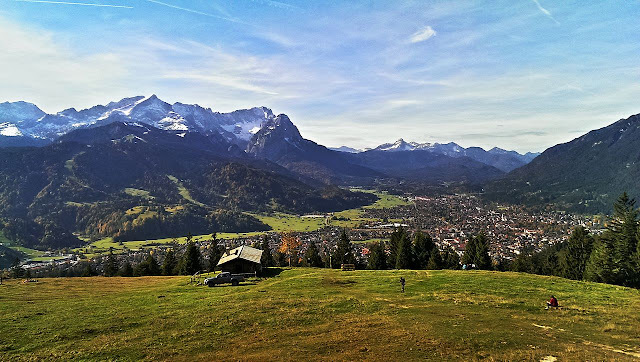 The Project represents a unique source of hafnium that is independent of all traditional markets – including China (currently accounting for at least 75% of world production of zirconium materials, and over 95% of zirconium chemicals), the nuclear zirconium industry and the zircon industry in general. To ensure a sustainable business case, the ASM processing plant will undergo staged ramp‐up in production volumes to keep pace with world demand. Start‐up volumes will be around 25tpa hafnium metal (30tpa HfO2), increasing in line with market growth; full plant capacity is conservatively estimated at 200tpa. Hafnium product pricing remains opaque due to security issues and limited production but the metal for super alloys is currently trading in a US$800 ‐ $900/kg range. The ASM business case assumes a conservative product price of US$500/kg for its oxide. In a European context ALD was invented independently twice in Europe (Russia & Finland) and since the last 15 years Germany has grown to become one of the strongest European markets for ALD in R&D, chemicals, equipment and end users. Here, Dresden and Saxony isa unique ALD hotspot due to a strong semiconductor and equipment industry. REGISTRATION OPENS & PROGRAM RELEASE 23 of January 2018! The tutorial will be organized by Adriana Creatore, TU Eindhoven, in cooperation with Jonas Sundqvist, Fraunhofer IKTS. Atomic Layer Etching Workshop (ALE2018) Call for Abstracts. Submission Guidelines. Prospective authors are invited to submit their abstracts online by February 16, 2018. Please review Steps 1-5 below before entering the online abstract submission site. Power electronic components are right at the heart of many core elements of our society, where energy saving, sparing use of natural resources, and CO2 emission reductions are called for to provide for sustainable future. Energy production with renewables such as wind and solar, clean transportation with electric vehicles and trains, and industrial manufacturing with energy-smart power management and factory automation are key markets where the demand for advanced power components is increasing. 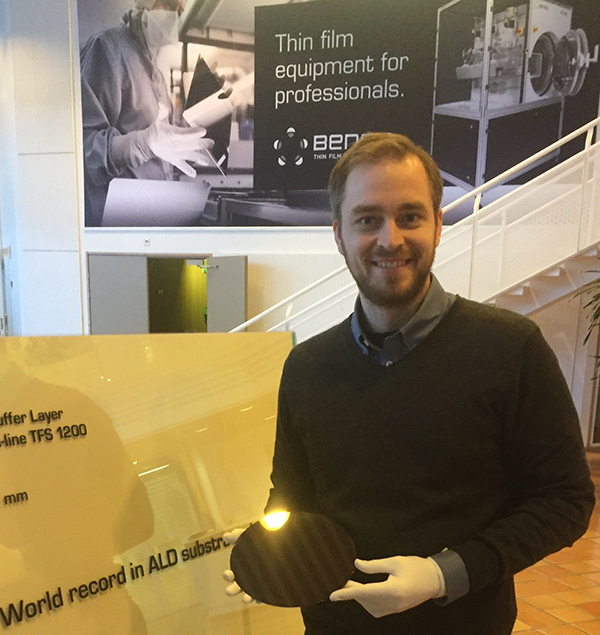 Most power semiconductor industries use 200 mm wafers as substrates. Transfer to 300 mm enables more efficient, ecological, and economical production through larger throughputs with relatively smaller material losses, and adaptation of novel manufacturing processes such as ALD allows smaller chip sizes with increased level of integration. As a part of the funded project R3-POWERUP (*), Picosun’s PICOPLATFORM™ 300 ALD cluster tool will be optimized and validated for 300 mm production of power electronic components. The SEMI S2 certified PICOPLATFORM™ 300 cluster tool consists of two PICOSUN™ P-300S ALD reactors, one dedicated for high-k dielectric oxides and one for nitrides, connected together and operated under constant vacuum with a central vacuum robot substrate handling unit. 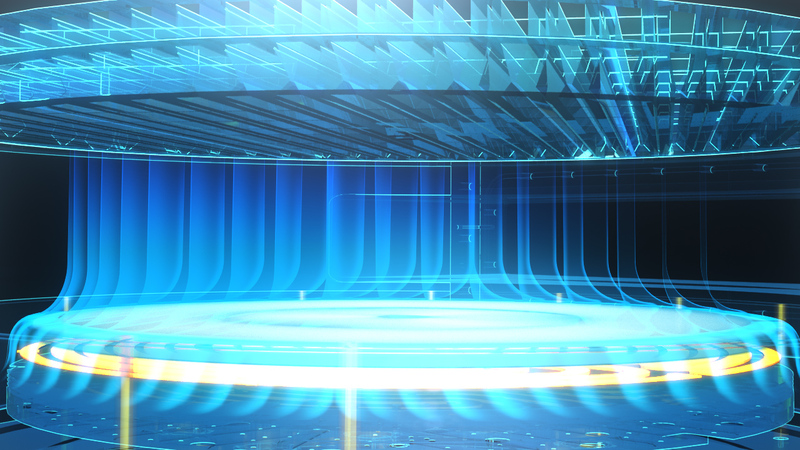 The ALD reactors are equipped with Picosun’s proprietary Picoflow™ feature which enables conformal ALD depositions in high aspect ratios up to 1:2500 and even beyond. Substrate loading is realized with an EFEM with FOUP ports. The fully automated cluster tool can be integrated into the production line and connected to factory host via SECS/GEM interface. “Our PICOPLATFORM™ 300 cluster tools have already proven their strength in conventional IC applications, so expansion to the power semiconductors is only natural. We are very pleased to work with a company such as STMicroelectronics to tailor and validate our 300 mm ALD production solutions to this rapidly growing market. This is also a prime opportunity both to contribute to the future of European semiconductor industries, and to utilize ALD to provide technological solutions to the global ecological and societal challenges such as climate change and dwindling natural resources,” summarizes Juhana Kostamo, Managing Director of Picosun. 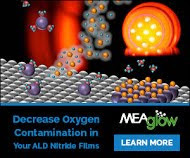 Norqay Technology, a company with more that 30 years experience in organo metallic precursors for ALD and CVD has just been acquired by MPD Chemicals. Please find press release below. TREVOSE, Pa., Jan. 11, 2018 /PRNewswire/ — MPD Chemicals (MPD), a US-based manufacturer of specialty chemicals and custom synthesis solutions, announced today the expansion of its manufacturing capabilities, product portfolio and customer base with the acquisition of Norquay Technology, Inc. (Norquay). Located in Chester Pennsylvania, Norquay is the fourth acquisition to be integrated into the MPD Holdings platform, an Addison Capital portfolio company; existing MPD businesses include Monomer Polymer & Dajac Labs, Silar, and IsoSciences. Elsa Alvaro, Angel Yanguas-Gil are done so you can stop what you are doing right now and check out the most interesting ALD publication in 2018! Find out what have been and what are the hot topics, materials applications, authors in the field of ALD. Also a big congratulations to the two most productive authors in scientific publishing in the field of ALD, Prof. Markku Leskelä and and Prof. Mikko Ritala of Helsinki University of Finland. This paper describes how Atomic Layer Deposition (ALD) has evolved over time using a combination of bibliometric, social network, and text analysis. We examined the rate of knowledge production as well as changes in authors, journals, and collaborators, showing a steady growth of ALD research. The study of the collaboration network of ALD scientists over time points out that the ALD research community is becoming larger and more interconnected, with a largest connected component that spans 90% of the authors in 2015. In addition, the evolution of network centrality measures (degree and betweenness centrality) and author productivity revealed the central figures in ALD over time, including new “stars” appearing in the last decade. Finally, the study of the title words in our dataset is consistent with a shift in focus on research topics towards energy applications and nanotechnology. Epitaxial deposition and process equipment maker Veeco Instruments Inc of Plainview, NY, USA says that Osram Opto Semiconductors GmbH of Regensburg, Germany has ordered a multi-reactor Propel High-Volume Manufacturing (HVM) gallium nitride (GaN) metal-organic chemical vapor deposition (MOCVD) system, as well as K475i MOCVD systems. 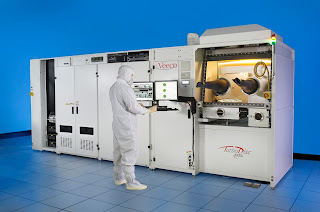 The K475i system incorporates Veeco’s Uniform FlowFlange technology, producing films with very high uniformity and improved within-wafer and wafer-to-wafer repeatability with what is claimed to be the industry’s lowest particle generation for demanding applications like photonics and advanced LEDs. Phys.Org reports that researchers at the Institute of Microelectronics Chinese Academy of Sciences (IMECAS), and Fudan University have used 2D MoS2 to design a new light-erasable memory. According to the article in Applied Physics Letter, the memory stack is based on an high-k dielectric stack (Al2O3/HfO2/Al2O3) and an atomically thin MoS2 channel, where he HfO2 act as the charge trapping layer. The holes in the HfO2 charge-trapping layer will tunnel to the MoS2 channel through the 4 nm Al2O3 tunnel layer. The future prospects for large scale manufacturing are there. Except for the MoS2 channel, both Al2O3 and HfO2 are standard ALD processing technologies since more than 10 years in the semiconductor industry and recent developments for flexible OLED Display manufacturing has made the ALD technology also available for large panel processing and roll to roll technology is just looking for an excuse high volume manufacturing.